Winter is coming! Don’t be left out in the cold when you don’t have to be! How? Invest in a good, time-efficient snow blower! Lucky for you, at Suburban Lawn Equipment we have the best snow blower deals available in Delaware. Plus, there’s no sales tax! Not sure whether you need a snow blower this winter? Check out these 4 Reasons Why We Think It’s a Must for any Home or Business Owner! Get the work done quickly! With Boss Snow Plows, you know you’re getting the best! Cub Cadet snow days are happening now. Take $100 off select Cub Cadet 2X and 3X Snow Throwers for a limited time only. Tough and dependable! Toro Snow Throwers are starting at $359 at Suburban Lawn Equipment! Powerful and easy to start! Check out our full line of Honda Snow Throwers starting at $599! Suburban Lawn Equipment is your local authorized BOSS, Cub Cadet, Honda and Toro snow plow dealer. Better yet? We service everything we sell and it is ready to use! Keep an eye out for more amazing deals from Suburban Lawn Equipment as we update our offers often! This entry was posted in BOSS Dealer, BOSS Snow Plows, commercial outdoor equipment, Cub Cadet Snow Throwers, Snow Blowers, snow removal and tagged BOSS Snow Plow Dealer Delaware, snow blower, snow blower deals, snow blower tips, snow blowers delaware, snow blowers for sale, Snow Plow, snow removal company, snow removal Delaware on December 11, 2018 by Suburban. Holidays are almost here! ‘Tis the season to shop and give back! Are you on the market for new outdoor power equipment? At Suburban Lawn & Equipment, we deliver convenience, efficiency and value for your investments. This is made possible by quality lawn mowers, string trimmers, chain saws, back pack blowers, edgers and generators from top manufacturers including Toro, Cub Cadet, Stihl, Exmark, Honda, Echo, Grasshopper, Hustler, Walker, Troy Built, Scag & Boss. Looking for the best holiday deals? Follow Suburban Lawn and Equipment on Facebook and check out our SPECIALS page for the latest outdoor power equipment updates and special offers! Financing is Available. Offer subject to credit approval. Some restrictions apply. Ask our experts for details. This entry was posted in BOSS Dealer, BOSS Snow Plows, BOSS spreaders, Commercial Lawn Equipment, commercial outdoor equipment, Honda Generators Delaware, landscaping business, Outdoor Power Equipment, Snow Blowers, snow removal, STIHL Outdoor Power Equipment and tagged BOSS Snow Plow Dealer Delaware, holiday deals, honda outdoor power equipment, Outdoor Power Equipment Delaware, Outdoor Power Equipment Needs, stihl outdoor power equipment on November 13, 2018 by Suburban. 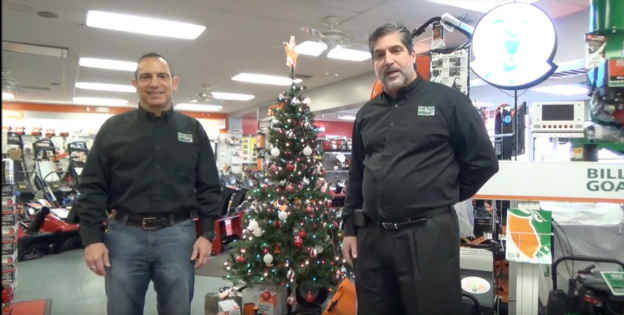 Happy Holidays from Suburban Lawn Equipment! It’s that special time of the year when we give blessings and thanks to cherish what we care the most about in life. Since Suburban Lawn Equipment wouldn’t be here without a family of hardworking and devoted people, today we’d like to introduce our team to you. Happy Holidays! We appreciate each and every one of our loyal customers! Suburban Law Equipment understands that winter may be a tough time for home/business owners trying to fight the harsh winter conditions. In case you missed it, here are some helpful resources to make this winter as painless as possible! Save Big on Outdoor Power Equipment this Winter! 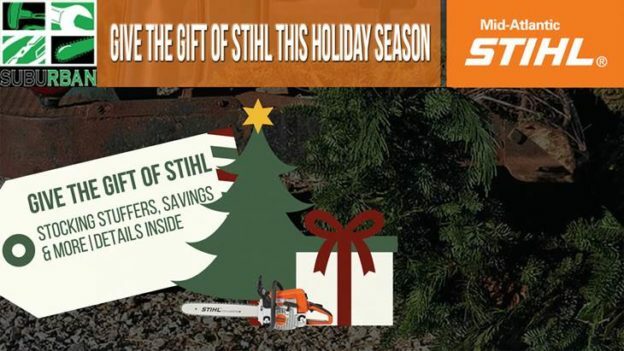 This entry was posted in Commercial Lawn Equipment, commercial outdoor equipment, landscaping business, Outdoor Power Equipment, Snow Blowers, snow removal and tagged commercial outdoor equipment, holiday greetings, Outdoor Power Equipment Delaware, Outdoor Power Equipment Needs, Suburban Lawn Equipment on December 19, 2017 by Suburban. Depending on where you live, you might have to deal with shoveling your driveway or backyard almost every single day. However, what if we told you that this chore doesn’t have to be so painful? Just let the Snow Thrower do the heavy lifting for you! 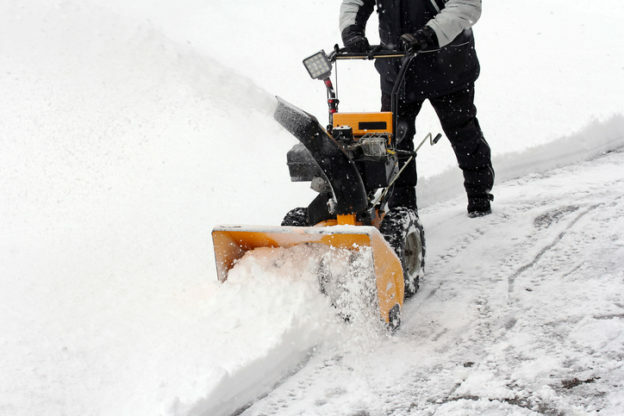 In today’s post, we gathered all the information you need to Choose The Right Snow Thrower For The Job. Backyard/ driveway size – Bigger equipment doesn’t always equal to a better job. Electric snow blowers can clear light snow from sidewalks and small driveways. For smaller driveways, single-stage units can do the job. For driveways over 60 feet, choose a two- or three-stage unit. Surface type – For level surfaces, use auger-assisted, push-propelled models. Engine-driven wheels will work best for sloped terrain. If you need more traction, you can use tire chains with some models. Snowfall size – Up to 12” – Use an Electric Snow Thrower. 13” – Single-stage, 23.5” – Two-stage, and up to 21” – Three-stage. Snowfall kind – Single-stage units can handle light snow. To cut through wet, hard snow or ice, go for a two-stage unit. 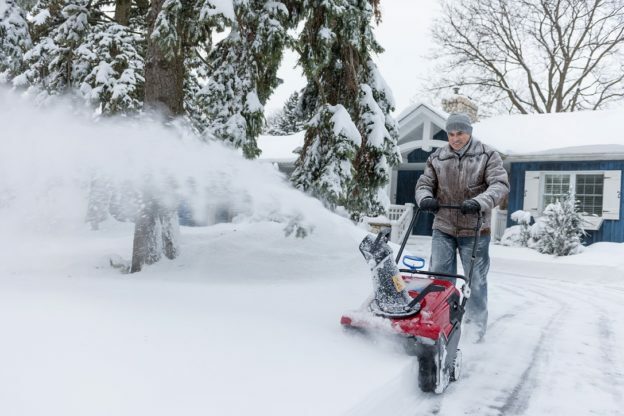 If you need to get the job done in less time, go for a three-stage snow thrower. Usage – Pick snow blowers that are well designed and easy to handle for an individual, such as this single-stage Honda snow thrower. Still not sure what snow throwers is appropriate for your needs? Make sure to stop by Suburban Lawn Equipment in Wilmington, Delaware! Our outdoor power equipment experts will be happy to assist you! we will assist you. Also, don’t forget to visit our Specials page! This entry was posted in BOSS Snow Plows, Commercial Lawn Equipment, commercial outdoor equipment, Cub Cadet Snow Throwers, Outdoor Power Equipment, Snow Blowers, snow removal and tagged cub cadet snow throwers, honda snow throwers, residential snow thrower, snow blower, snow thrower, snow thrower dealer, snow thrower guide, snow thrower tips, snow throwers, snow throwers delaware, Suburban Lawn Equipment, the right snow thrower, the right snow thrower for the job, Toro Snow Throwers on November 21, 2017 by Suburban. Looking for the best solution to avoid the dreadful winter task of removing the snow with a shovel and your bare hands? Let’s face it, using a shovel is not the most practical equipment for heavy snow removal. Especially, if you’re on the time crunch trying to get to work in the morning! Maybe it’s time to work smart – not hard – and invest in a new snow blower? In our opinion, the right winter outdoor power equipment is every homeowner’s best friend! Why? We’ve got 4 reasons for you below. Time efficiency. When you find your driveway stuck under a lot of snow, a snow blower will clear your way within minutes! No more standing in the freezing cold in the morning before work! Even just a small snow blower can remove up to 650 pounds of snow in 60 seconds! Amazing, huh? Safety. A snow blower is so efficient, it can effortlessly throw snow 20 to 30 feet away! Who doesn’t love a flawless and safe driveway in the winter, especially when you do a lot of walking? No more back or shoulder pain! Do we need to say more? No hustle! Operating a snow blower is so easy! Just start the machine and direct it in the right way! As you can see, the snow blower can be a great investment for your home during the colder months. Worth remembering: Clear any debris within its path to avoid damage and to clear snow up and down rather than going across. We highly recommend checking out our current snow blower specials. 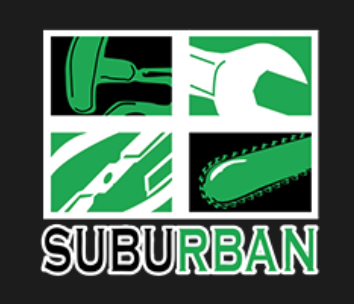 Also, keep an eye out for more amazing deals from Suburban Lawn Equipment as we update our offers often! This entry was posted in Commercial Lawn Equipment, Outdoor Power Equipment, Snow Blowers, snow removal and tagged benefits of having a snow blower, commercial outdoor equipment, outdoor lawn equipment delaware, Outdoor Power Equipment Delaware, snow blower, snow removal Delaware, snow thrower, winter sale on October 24, 2017 by Suburban. 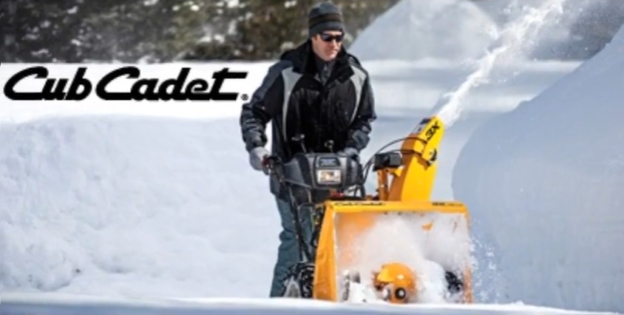 Cub Cadet Snow Thrower Winter Sale Is Here! Don’t Get Left Out In The Cold This Season! 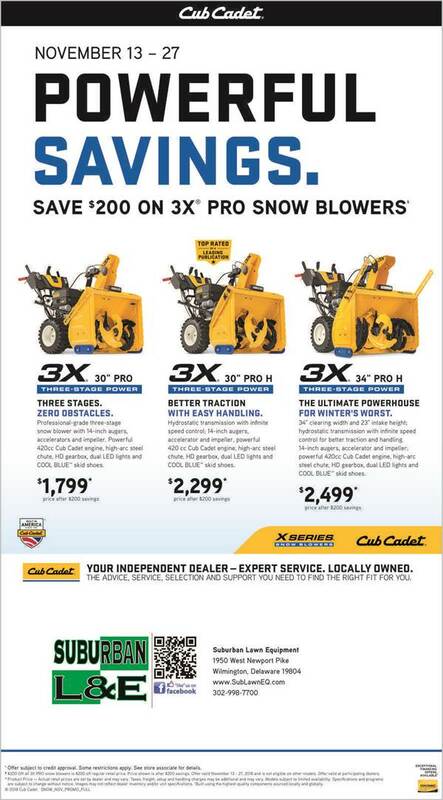 Cub Cadet Snow Thrower Winter Sale Is Here! Come down to Suburban Lawn Equipment in Wilmington, Delaware, and get advantage of the Cub Cadet X-Series Snow Throwers starting at $399! Winter Sale ends December 11. 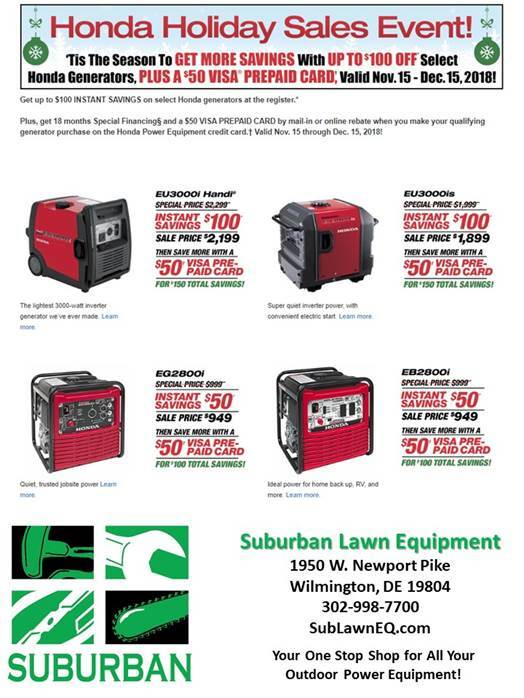 Suburban Lawn Equipment offers top quality outdoor power equipment including snow throwers to homes and business owners in Delaware, Pennsylvania (Chester County), Maryland (Cecil County), and New Jersey (Salem County). We deliver convenience, efficiency and value for your investments. This is made possible by quality snow throwers from top manufacturers like Cub Cadet. Our knowledgeable staff will explain your options and help you find the right one for your needs. This entry was posted in commercial outdoor equipment, Cub Cadet Snow Throwers, Outdoor Power Equipment, Snow Blowers, snow removal and tagged Cub Cadet, cub cadet delaware, cub cadet snow blowers, cub cadet snow throwers, Delaware, snow blowers delaware on December 6, 2016 by Suburban. It saves time. Did you know a small snow blower can remove up to 650 pounds of snow in 60 seconds? When you find your driveway stuck under a lot of snow, a snow blower will clear your way within minutes! No more standing in the freezing cold in the morning when you’re supposed to be on your way to work! It does the work for you! All you got to do is start the machine and direct it in the right way! No more problems with your back or shoulders! It keeps you safe. A snow blower is so efficient, it can effortlessly throw snow 20 to 30 feet away! Who doesn’t love a flawless and safe driveway in the winter, especially when you’re using foot traffic?! Needless to say, the snow blower is a great investment for your home during the winter season. Just remember, clear any debris within its path to avoid damage and to clear snow up and down rather than going across. 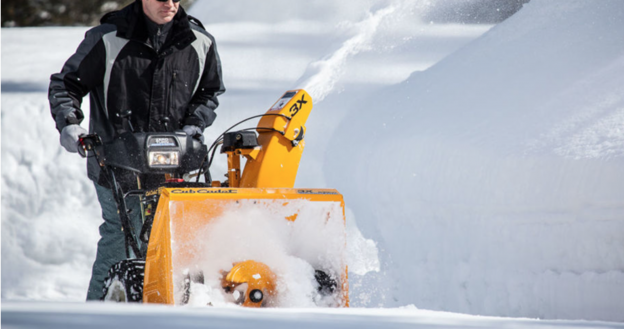 We highly recommend checking out our current Cub Cadet Snow Days Special, where you can get 10% off any model in the Cub Cadet X-Series Snow Throwers from your authorized Cub Cadet Dealer in Delaware. The promotion ends in 4 days on October 8th! 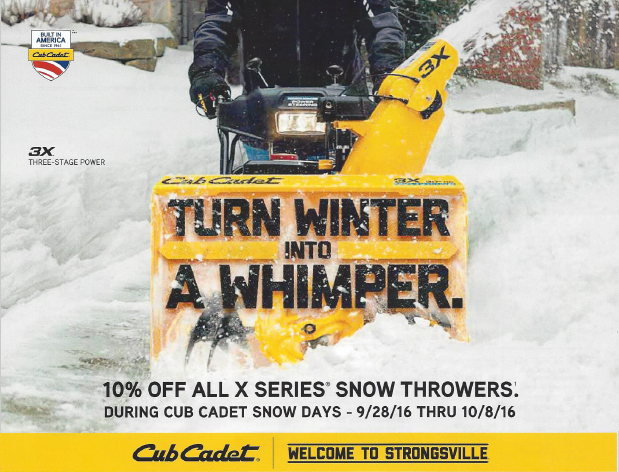 This entry was posted in commercial outdoor equipment, Cub Cadet Snow Throwers, Outdoor Power Equipment, Snow Blowers, snow removal and tagged commercial outdoor equipment, cub cadet snow blowers, Delaware, snow blower tips, snow blowers delaware, snow blowers for sale, snow removal company, snow removal Delaware on October 4, 2016 by Suburban. If the idea of shoveling or using a snow blower on a wintry day makes you cringe, you may want to consider hiring a snow removal company before the white stuff gets here. Will they return in spring to repair any damage? It is wise to interview several contractors and get quotes for comparisons. Also, be sure to get a written contract, do not rely on verbal assurances. Finally, check with your local Better Business Bureau to be sure the company has no complaints and see what type of rating they have. By doing your homework, you can find a snow removal contractor that you can trust and rely on for many winters to come. And if you decide to do it yourself, you may want to invest in a quality snow thrower. We carry a full line of residential and commercial snow removal equipment. Stop by Suburban today. This entry was posted in BOSS Snow Plows, BOSS spreaders, commercial outdoor equipment, Snow Blowers, snow removal and tagged how to choose a snow removal company, snow removal company, snow removal Delaware on February 2, 2016 by Suburban.